Reporters Sidney San Martin and Jacob Dodd went down to the Grand Opening of the Willowbrook Mall today to check out the scene. 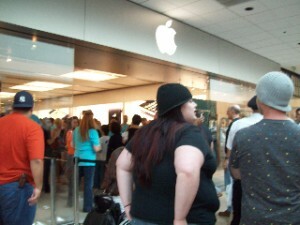 Today marked the grand opening of the widely anticipated Willowbrook Mall Apple Store in Wayne New Jersey. Rumored to be coming to the complex since March of this year, this Apple retail store marks the 11th to be opened in the New Jersey area. A line of perhaps 200 people formed outside of the store ahead of it’s official launch at 10AM. The store employees energetically participated in the event, dancing behind the glass facade of the store before the opening, high fiving customers as they entered the store and starting a chant of “Let’s go Apple!”. As per custom, 1,000 T-shirts were given out to the stores first vistors. Several iLife staff members got a chance to test out some of the new iPod models, coming away particularly impressed by the new Nano, as has been reported by other sources it is quote “very sleek and and fits in your hand great!”. Many wonder if it will be possible to make the next generation of Nano’s any smaller without making a significant redesign to the dock connector, which has now become the bottleneck for the device’s dimensions. The Willowbrook Mall Apple Store is now the most conveniently located Apple retail store for most of the iLife staff, making this event particularly special. Videos of the interviews conducted are coming soon! Stay posted to theiLife.com for the latest. Although a writer from theiLife.com will not be present at the Let’s Rock event, theiLife will be providing a liveblog for readers to watch the events unfold live. Information coming in from a collaboration of sources will be compiled and continuously updated on this page as the event unfolds. You can bookmark this page now, and at 10AM PST or 1PM EST, start your refreshing! For now, read up on the rumors! 1:25AM EST The liveblog page is up! Only about 12 more hours!! 9:58AM EST The rumor mill is heating up. There have been swirls of new rumors in these last remaining hours. The event is only about 3 hours away! 11:00AM EST Apple Online Store is down! It is getting closer!! 11:44AM EST Several people in Barbarian Group t-shirts have been spotted outside the event. Hmm.. that would corroborate with the Magnetosphere iTunes visualizer rumor. 12:40PM EST T-minus 20 minutes to the start of the event. 12:55PM EST Reporters are filing into the hall with rock tunes bumping! 1:01PM EST Steve Jobs just took the stage. Energetic and skinny, we hear. 1:02PM EST Over 8.5 million songs are available on iTunes. 125,000 podcasts, 30,000 TV shows, 2,600 movies, and 3,000 applications for iPhone and iPod Touch. 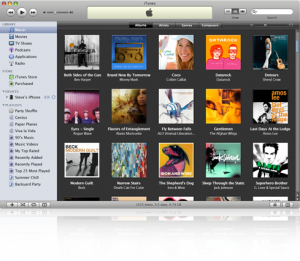 65 million user accounts on iTunes. 1:06PM EST“iTunes is getting some new content”. First is High Definition TV shows. HD shows will be $2.99 for computer or Apple TV. 1:07PM EST iTunes 8. The rumored grid view is true. Genius playlists can be made with just one click. 1:08PM EST NBC is back! 1:09PM EST iTunes 8 will be available for download today. 1:10PM ESTGenius information gets sent to iTunes to give them your musical tastes. It’s sent anonymously, and is completely optional. 1:13PM EST Steve just played a John Mayer song. The internet l0lz. 1:15PM EST iPod has a 73.4% marketshare. Followed by 8.6% for SanDisk, Microsoft with 2.6 and other for 15.4%. 1:17PM EST The 80GB is being upgraded to 120GB, and the 160GB is being discontinued. 1:19PM EST New skinny nanos are true. 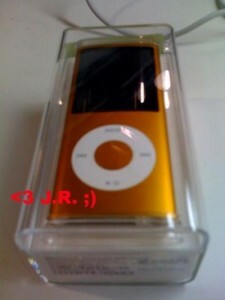 Skinny, rounded, and a lot like the 2nd gen Nano. Portrait aspect ratio plus the exact same resolution display. 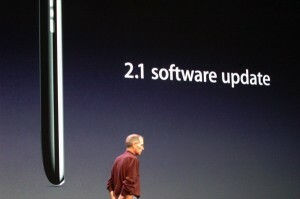 1:21PM EST They have added curved glass over the screen, new user interface, and an accelerometer! 1:23PM EST Shake to shuffle is true. 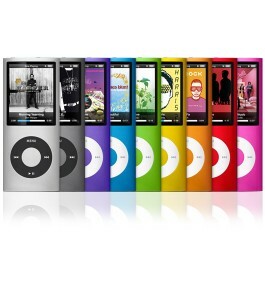 Shake the iPod nano, and it will shuffle. 1:25PM EST 24 hours music, 4 hours video. Jobs says that it’s the thinnest iPod ever. 1:26PM EST Purple, blue, green, yellow, orange, red, pink, and silver. $149 for 8GB; $199 for 16GB. Both are shipping today; 8GB’s shipping today, 16GB should be in stock by the weekend. 1:30PM EST New accessories including headphones and armbands. The headphone, actually, has an in-band control feature to have volume control, playback control (next, prev, play pause) from the button. There’s also a microphone on the back that works with the voice recording app. These will be $29 next month. 1:35PM EST Over 100 million apps downloaded from the App Store. 1:36PM EST New iPod touch has built in Nike+ support. 1:38PM EST Phil Schiller coming on stage to introduce some unannounced games. 1:39PM EST Demoing Spore. Moving to Real Soccer 2009. 1:45PM EST Now moving to Need for Speed Undercover. 1:48PM EST Both the nano and touch are arsenic-free, BFR-free, Mercury-free, PVC-free, and highly recyclable. Steve is back on the stage and calls the touch the “funnest iPod ever”. 1:50PM EST Touch battery life is 36 hours of music, 6 hours of video. 1:51PM EST The 8GB is $229, 16GB is $299 and 32GB is $399. All available starting today. 1:53PM EST iPhone OS 2.1 available for free for all iPhone and iPod touch users who are already on 2.0. Lots of performance and bug fixes within. 2:03PM EST Looks like “Let’s Rock” is over with. Thanks for joining us! 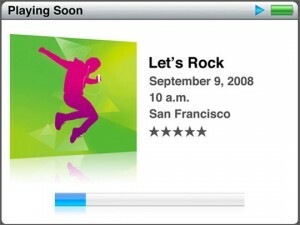 Apple set to “Rock On” Tomorrow – New iPods, iPhone OS 2.1 and iTunes 8? Apple last week has sent out invitations to its latest special event entitled “Rock On” which is scheduled to take place tomorrow, Tuesday, September 9th. 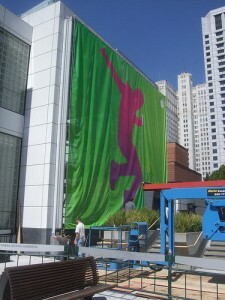 Tomorrow, at the Yerba Buena Center in San Francisco, Apple is expected to reveal the latest line of iPods, in time for the holiday season. 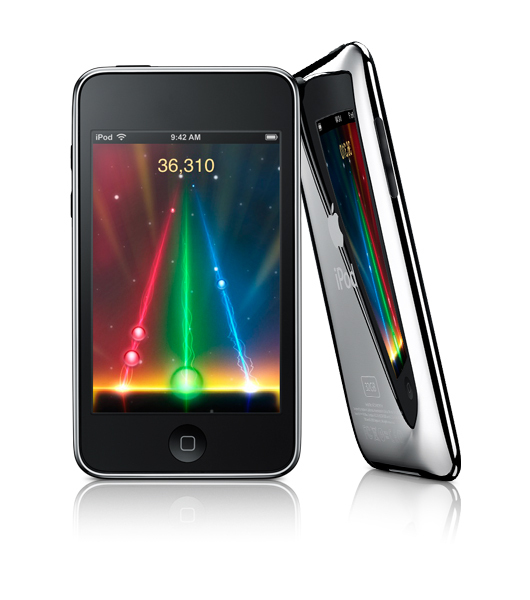 This years event seems to have more hype with the iPhone 3G starting at a price smaller than the majority of the iPod line. Tomorrows announcements could potentially be apart of the product transition mentioned by CFO Peter Oppenheimer. 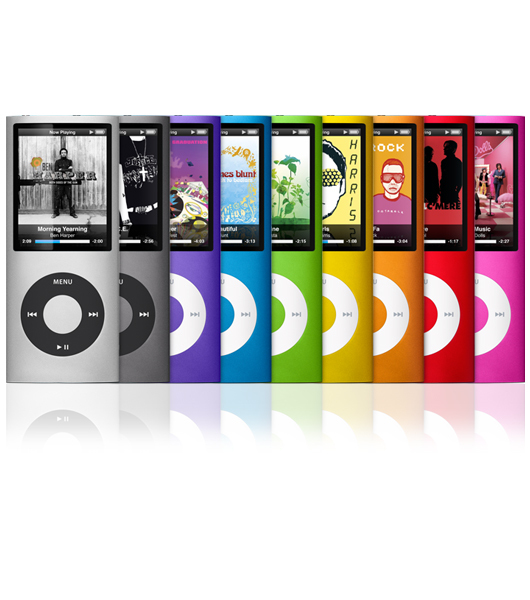 Rumors are pointing to a redesign of the iPod nano, possibly back to the slim factor, away from the fat, which was introduced last year. Some new “fourth generation cases” and supposed leaked shots have found their way to the internet, and it is believed that they are for the most part legitimate. The iPod touch is also rumored to get some small cosmetic changes. It is not clear what they are at this time, other than the above spec sheet, but there isn’t much compelling evidence as to what might change. 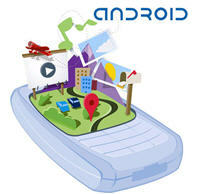 Other rumors point to new buttons (such as a volume rocker on the side) or GPS being added. Many sources believe the upcoming iPhone OS 2.1 is going to be being dropped tomorrow. While Apple did promise it’s release in September, like the 2.0 version of the OS, it could end up being delayed. Some possible features include turn-by-turn directions along with the promised Push Notification system could make the update truly worthwhile to iPhone 3G or possible second generation iPod touch (GPS?) users. A number of sources have also mentioned the possible release of iTunes 8 tomorrow. Some rumored new features include a new visualizer, a grid view and a Genius playlist that would act like Pandora by suggesting related songs and artists. While it is unknown what exactly will happen, like all Apple events, the rumors generally have a good idea what might happen. Stay tuned to theiLife.com for the latest coverage regarding the Rock On event!